It’s a Pre-Memorial Day Improvisational Comedy Show at Cranky Hank’s Pizza! 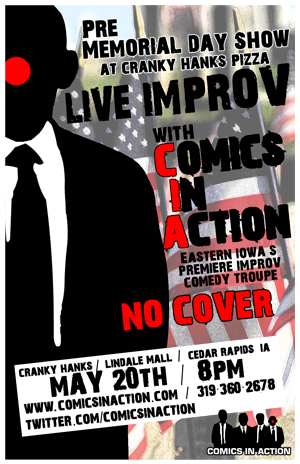 It’s Comics In Action’s 3rd show for 2011, and we’ll be performing at Cranky Hank’s for our annual Memorial Day show. Once again, there’s NO COVER for this show, so there’s no reason why you shouldn’t be able to fill your evening with Agent Butters, Agent Steakums, Agent Danuuc and Agent Sapien. Grab some pizza and a couple cold “brew-sky’s” for an enjoyable evening of improvisational comedy. Be in Cedar Rapids, this May 20th at 8pm in the fine establishment of Cranky Hank’s Pizza, located in Lower-Level Lindale Mall, just underneath Younkers! If your on Facebook, let us know if you are attending!